A quarter horse gelding presented with a full-thickness laceration (13.1 cm by 4.5 cm) caused by a severe attack by another horse. Due to the size of the wound, no stitches could be applied (photo on left). Banixx was used twice daily. After 22 days of Banixx applications, the wound had completely closed on this horse with only a thin white scar remaining (photo on right). 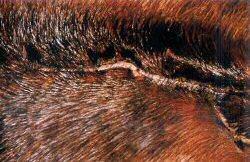 The horse was stabled during the day to prevent sun damage to the exposed, unprotected skin. Banixx was the only product used (prescription or non-prescription) for this infected wound. New, healthy tissue growth was quick and no infections occurred. 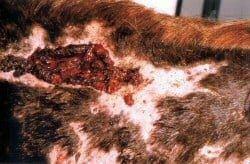 We have received feedback from a number of veterinarians that Banixx has worked very well with lacerations on horses, cats, and dogs, even with cuts as severe as this one.